A hygienic environment is especially important in meat and seafood processing plants, where unsanitary conditions can result in tasteless product, spoilage and worse – food-borne illnesses. 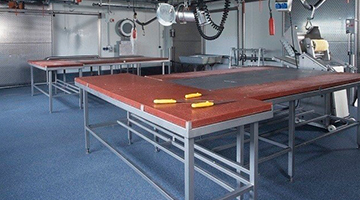 To prevent financial loss and potentially life-threatening health contamination, flooring for meat and seafood processing facilities must support stringent disinfection and sanitation practices. Florock offers a full line of industrial floor coating systems that not only help achieve a hygienic and contaminant-free environment, but also offer great lifecycle value. When it comes to meat, fish or poultry plants, cleaning and sanitation are priority. From fresh meats to pre-packaged, vacuum-packed products, the right setting can help ensure low exposure to microbes and guarantee product quality and shelf life. Unlike rubber or PVC flooring, our industrial floor coatings do not require adhesives and can withstand constant exposure to fish oils, animal fats, and offal. 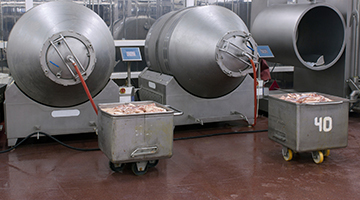 Together, these properties ensure that floors in meat and seafood processing facilities as well as abattoirs can stand up to regular pressure washing and steam cleaning, while helping maintain a contaminant-free environment. Our flooring solutions, in conjunction with proper slope drainage, help prevent the creation of breeding grounds for contaminants. And if this wasn’t enough, our flooring systems are also fully customizable with decorative toppings like colored chips and quartz blends. Because many meat, poultry and fish storage facility floors are nearly always wet from both condensation and frequent washdowns, the flooring must be able to withstand non-stop exposure to extreme moisture. This aspect of the environment excludes a broad range of industrial flooring. However, Florock’s solutions offer a range of highly moisture tolerant floor coating options. Contact a Florock Technical Representative to learn about the best flooring systems for meat, poultry and seafood processing plants.